Washington senior Kassidy Hines is guarded by Grove City’s Ellie Pollack-Bullard during a non-conference game at Washington High School Sautrday, Feb. 2, 2019. 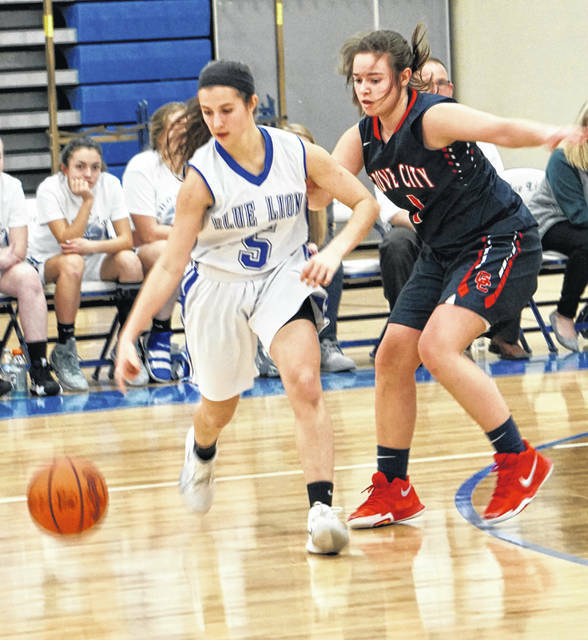 The Washington Lady Blue Lion varsity basketball team hosted Grove City in a non-conference game Saturday, Feb. 2. Washington won the game, 51-25. The Lady Lions are now 14-4 overall. Washington was led by senior Hannah Haithcock with 24 points. She also had six rebounds, five steals and three assists. Junior Shawna Conger scored 14, senior Bre Taylor had nine points and junior Rayana Burns scored four. Burns also had 10 rebounds, six assists, two steals and two blocked shots. Conger also had four assists. Washington had 30 rebounds, including seven on the offensive glass. The Lady Lions had nine turnovers, 17 assists and 10 steals. Ellie Pollack-Bullard and Alyssa Fuches led Grove City, each with six points. Washington led 11-5 at the end of the first quarter and 25-7 at halftime. The Lady Lions led 37-15 after three quarters of play. “We got off to a great start today,” Washington head coach Samantha Leach said. “I just felt like it carried through all four quarters. Washington (14-4) will be back in action Wednesday at home against Waverly with the j-v game at 5:30 p.m.
Washington is a No. 2 seed in the upcoming Sectional tournament and will play Waverly Thursday, Feb. 14 at 6:15 p.m. at Adena High School. Sectional tickets will be on sale in the fish bowl entrance of the Washington High School gym from Feb. 11-14 from 8-11 a.m. and 1-3 p.m. Washington gets to keep 25 percent of all pre-sale tickets. Washington will play at Miami Trace Saturday. There will be four games Saturday at the new Miami Trace High School with the j-v boys going first at 3 p.m., followed by the j-v girls at 4:30 p.m. The varsity boys game is set for 6 p.m. with the girls varsity game at 7:30 p.m. The Lady Lions will host McClain Monday, Feb. 11, which will be Senior Night. WASHINGTON — Rayana Burns 2-0-4; Bre Taylor 4-1-9; Kassidy Hines 0-0-0; Tabby Woods 0-0-0; Shawna Conger 0 4)-2-14; Maddy Jenkins 0-0-0; Hannah Haithcock 9-6-24. TOTALS — 15 (4)-9-51. Free throw shooting: 9 of 10 for 90 percent. Three-point field goals: Conger, 4. GROVE CITY — Ellie Pollack-Bullard 1 (1)-1-6; Madison Grube 0-0-0; Ally Pope 0-0-0; Alissa Schiff 1-0-2; Alex Jones 0-0-0; Jacla Van Houten 0 (1)-0-3; Laney Hoyt 0-0-0; Grace Fisher 0-1-1; Riley Waugh 0-0-0; Lauren Walls 1-0-2; Olivia Bartley 0-0-0; Alyssa Fuches 3-0-6; Becca Conrad 2-1-5. TOTALS — 8 (2)-3-25. Free throw shooting: 3 of 7 for 43 percent. Three-point field goals: Pollack-Bullard, Van Houten.